Story: In this adaptation of Shakespeare’s comedy, Twelfth Night, a young woman named Viola is separated from her twin brother Sebastian in a storm and shipwrecked in a remote country. Even stranger, Viola and Sebastian live in the 16th century but find themselves swept away to 21st century America. Viola learns from a history teacher named Mike that she is in Old North St. Louis, where people look out for each other with the help of their friendly local police officer Toby. The latter is pals with the oafish gadfly Andrew Aguecheek, who has a crush on Maria Verona, owner of the area’s gathering place, La Mancha coffeehouse. All are admirers of Olivia, the local podiatrist, a woman who is the object of the unwanted affection of the pompous resident Malvolio. Disguising herself as a young man named Cesario, Viola is sent by Orsino, a local barber, to deliver a message of love to Olivia. The latter isn’t interested in Orsino but falls instantly for ‘Cesario,’ who in turn is smitten with Orsino. The love-struck barber eventually marries Viola after she reveals she is a woman, her twin brother Sebastian marries Olivia and Toby weds Maria. Malvolio is left fuming on the sidelines while village artist Feste sings in troubadour style about all of the characters. 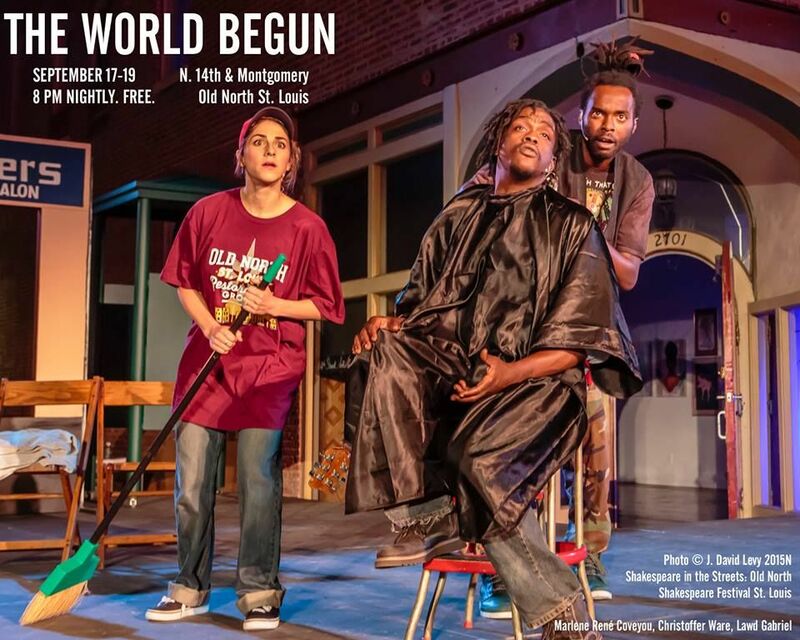 Highlights: Nancy Bell, playwright-in-residence at Shakespeare Festival St. Louis, has adapted a different Shakespearean play in each of the last four years, each time updating it to a particular neighborhood in metropolitan St. Louis. 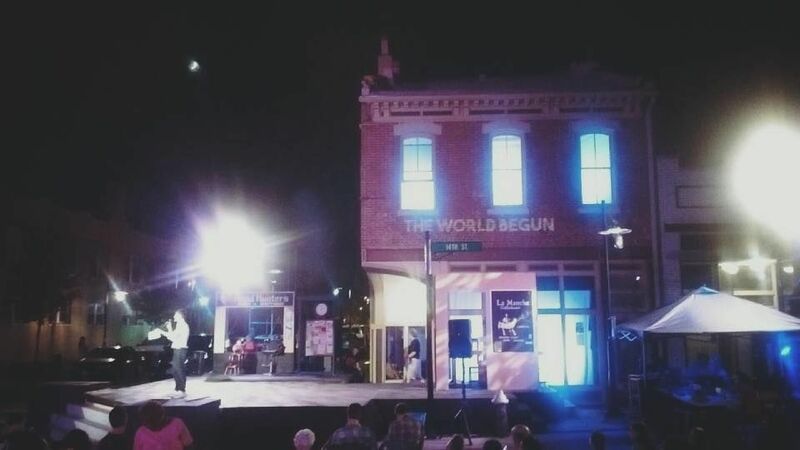 This year’s entry, The World Begun, ingeniously weaves characters and the primary theme from Twelfth Night into a story which accentuates the particular good will and camaraderie that characterize Old North St. Louis. It played to large audiences at three performances last weekend. Other Info: Bell’s one-act, 70-minute work is a clever combination of old and new, maintaining the primary traits of Twelfth Night’s characters, their foibles and their romances, as she integrates the 16th century tale into a paean to the hearts and minds of the faithful residents of one of St. Louis’ oldest neighborhoods. Along the way, she educates patrons who, in some cases, may not be aware of the buoyant atmosphere in this sector. The scenic design by Mark Wilson makes shrewd use of the intersection of Montgomery and St. Louis avenues, one block removed from the historic Crown Candy Kitchen and its new neighbor, La Mancha coffeehouse. Additionally, the sides of buildings at the merging of those two streets are illuminated by Wilson to focus on themes and ideas relevant to the play. Director Jacqueline Thompson blends professional actors with local residents to pepper this whimsical tale. John Bratkowski, a fourth-generation resident of the Old North St. Louis neighborhood and the first president of the Old North Saint Louis Restoration Group, amusingly portrays the thick-witted Malvolio, who in this version frequently bad-mouths the people and area of Old North St. Louis. Bratkowski adds a fresh flavor of comedy to his character’s acid-tongued remarks, looking garish and foolish in costume designer Felia Davenport’s intentionally tacky attire. Marlene Rene Coveyou is wonderfully buoyant and captivating as the plucky damsel Viola, sharing some fine comedy and chemistry with Lawd Gabriel as the neighborhood leader Orsino. Carl Overly Jr., resplendent in a fancy Davenport T-shirt, delights the audience as the good-time Andrew, paired winningly with local police officer Richard Schicker as his pal, Toby. Lisa Tejero provides both deft comedy and dogged determination as Maria, owner of the coffeehouse frequented by neighborhood clientele. Robert Green is a regular customer there, too, as revealed in a cameo bit. The cast also includes Christoffer Ware as the artist Feste, who hangs out at the barber shop while crafting his clever ways. Patrick Blindauer is engaging as the genial history teacher Mike, Michael Cassidy Flynn is fine as Sebastian and Erin Renee Roberts is a lively and amorous Olivia. Tarecka “Queenie” Smith and Aniyah Wilson alternate in the role of a sharp local Girl Scout named Antonia. Michael Perkins’ sound design and Meg Brinkley’s props complement the action in the expansive stage area, as does Jennifer Medina’s fluid choreography. The World Begun crackles with a vibrant energy and charms with its heartfelt valentine to the intrepid souls who have kept Old North St. Louis vital and vivacious since the 19th century. It’s a feel-good story in more ways than one.